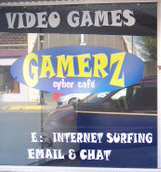 The Rock the Net Caffe in Lebanon, OR is remodeling the old Gamerz Cyber Cafe and turning it into a sci-fi and fantasy gaming haven. The walls and corridors will all be done in hyperspace themes, and XBoxes and computer stations will be available for all types of online gaming. They’re also adding a room called “The Dungeon”, specifically devoted to low-tech gaming such as RPGs and fantasy board games. You can see their remodeling efforts here.